Recorded last night at his high school. He was fortunate to be able to play accompanied by his piano instructor, which was cool for him. So we've been working on our landscaping the last few weeks. When we bought this house a year ago, it was pretty weathered. We've already done work inside - a LOT of work - but the outside was also quite unkempt. We started by removing some poorly-placed trees in the backyard, which we already talked about here. There were also some plain-looking plants in the front of the house, but we thought we could improve the look and "curb appeal" of the house if we made some improvements there. 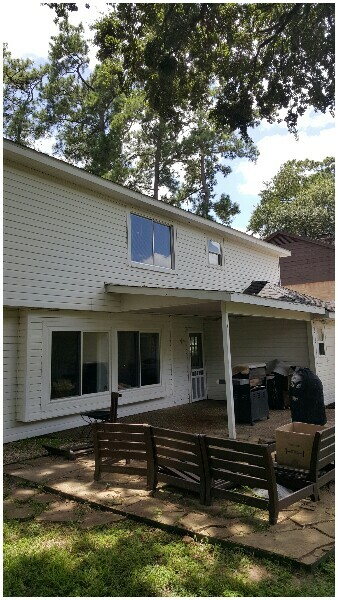 These are what we installed below both large picture windows in the front. Two small white-flowering bushes on each side, with a small red-flowering between them. We added a couple of rose bushes that were grafted to trees, and put those in pots next to the front door. We have two VERY tall pine trees in the front lawn, with a kind of make-shift stone bed around them. We removed the plants (and weeds) that were in there and added some roses, gardenias, calla lillies and dragon flowers. We also added some gtrasses around the patio in back. Those are just starting to come out of their winter dormancy. We will cut these back this weekend so they can grow anew. And, this is what's going on in the vegetable garden: basil, oregano, rosemary, jalapenos and tabasco pepeprs, tons of onions and a bunch of heirloom tomatoes, some in the raised garden, others in post. There are also two avacado trees (one more ordered) an two lemon trees, also in pots. Can I just add? It is AWESOME living in an area where we can start the vegetable garden around Valentine's day, and where it is warm enough to grow all these vegetables, fruits and flowers pretty much year-round. We still love it here in Texas. We cook our birds pretty much the same way every year now. If it isn't broke, don't fix it, eh? 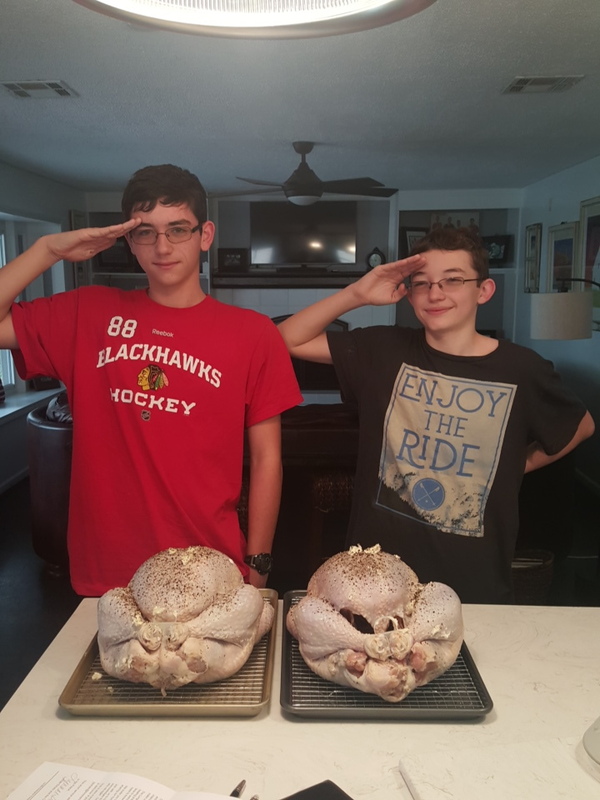 But first we always salute the bird. This year was no different. These were the results: one roasted in the oven, one smoked on the new smoker. They were terrific, if I do say so myself. In the first song, he played suspended cymbals. In the second, he played marimba. Then he played timpani. This was his favorite. Cody likes to bang things! Cody is getting a really terrific fine arts education at his grade school. We are very proud of all he's accomplished so far. And we can't wait to see what the future holds for this fine young man. This time, removing some ill-placed trees. We still have work to do in the yard, but this is an excellent start. We had some new wrought iron fences installed around the house. This one went into the breezeway, replacing a solid wooden fence that was there. It was also moved outside the back-door to the house, and the garage door. The old fence was on the other side, with the house's back-door, and the garage door, outside the fence. And this fence replaced a completely worn old wooden fence on the other side of the house. We like both of them a lot. The fences were installed by Texas Fence Co. and we like thei work. We're going to use them again when we replace the the rest of the old wooden fence in our yard. 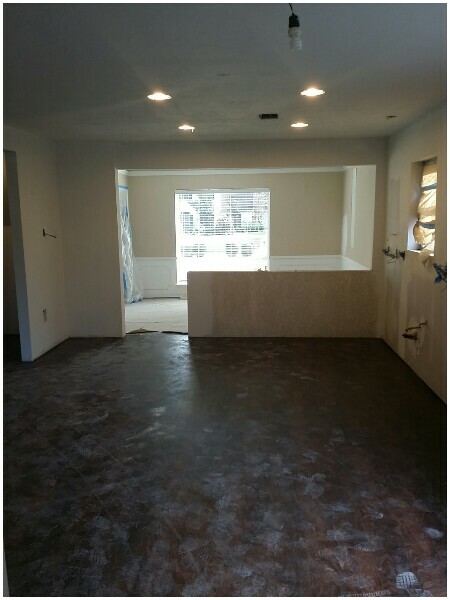 Well the kitchen and bathroom remodel project for our new house in Spring, TX is complete. Carolyn and I both love it. 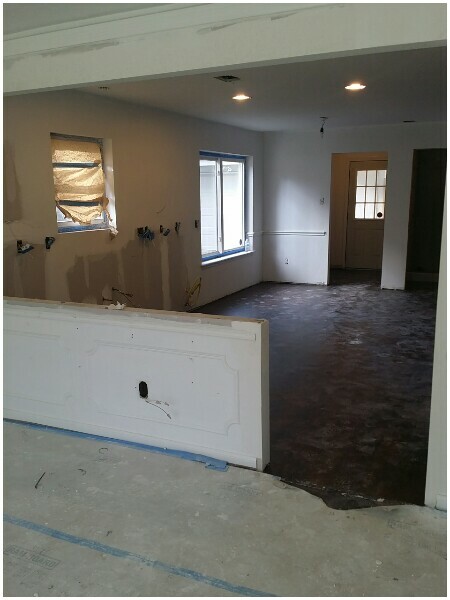 The team at TXI Homes did a terrific job, from design (with our input) to demolition to rebuild. They even accommodated our last-minute changes. 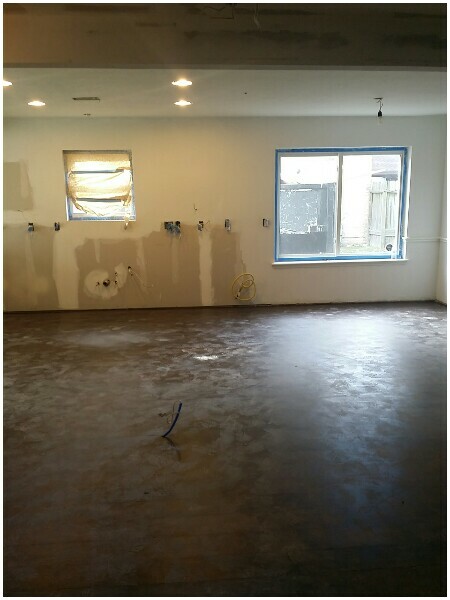 Here is the before image of the kitchen, taken from the back door. 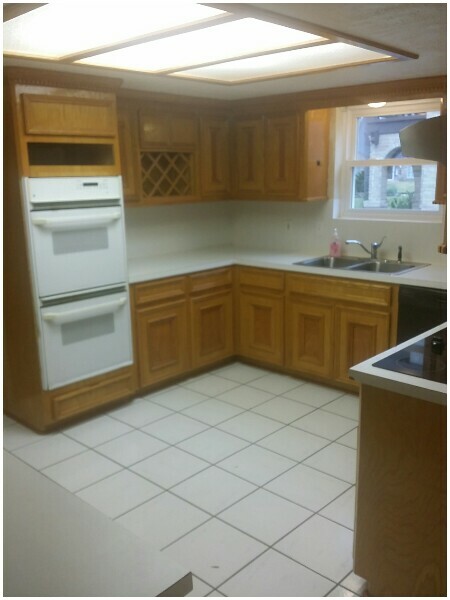 look how low those old cabinets hung down. 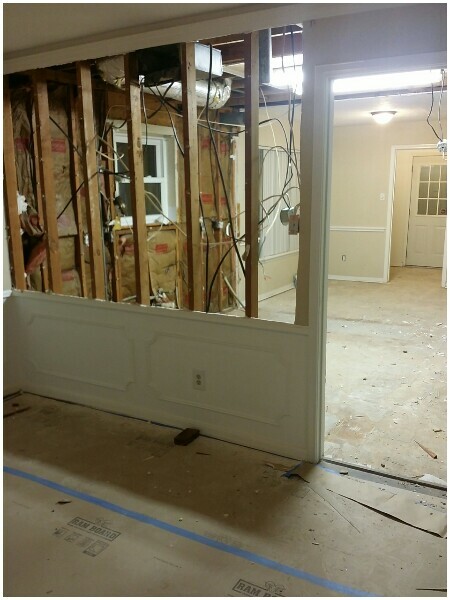 We removed that wall, but kept the lower part, with the wainscoting - one of those last-minute changes. We added a breakfast bar here, above the half-wall. The house had a kind of built-in wet bar (1970s again!) 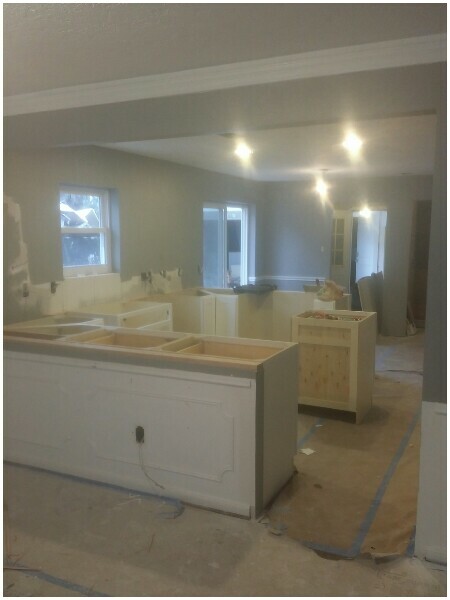 that we removed, and in place of that we added a gigantic island (6 x 5 feet), with five cabinets and a wine fridge underneath. To set that off from the rest of the kitchen, and also to contrast with the white quartz counters, we painted the island cabinets black. The 1st floor also has a half-bath. We blew that out and reconfigured the walls (taking a little room from the laundry room next door). 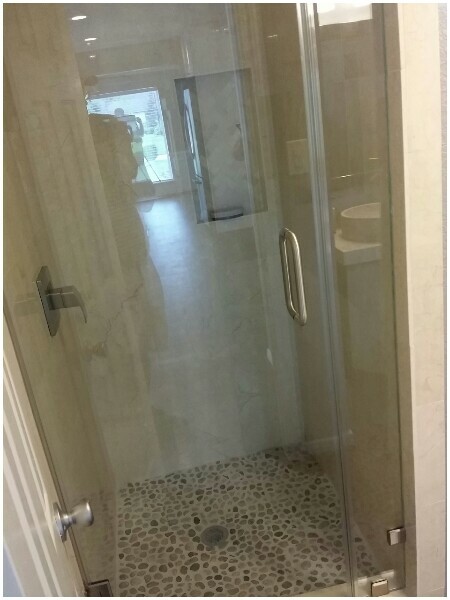 That allowed us to add a shower. 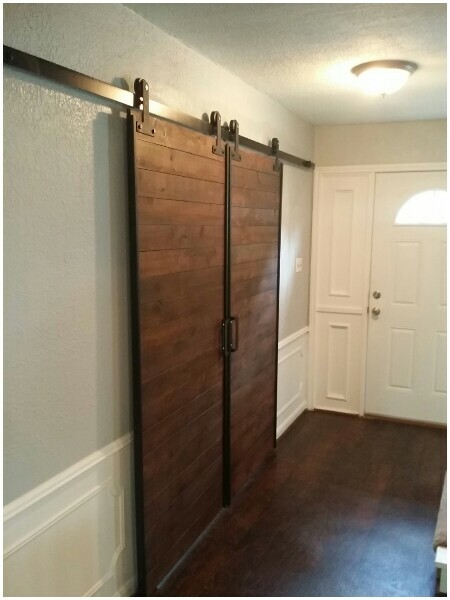 We also added some barn doors into the old formal living room, which is now destined to be the kids' 1st-floor game room. Carolyn is still painting the bedrooms upstairs, but we're ready to move in. In fact, we've already started moving stuff over to the new house. The official move-in date is April 18th. Wow. Tremendous progress so far. We can hardly believe it. The wall-mounted double oven? We're getting rid of that too. 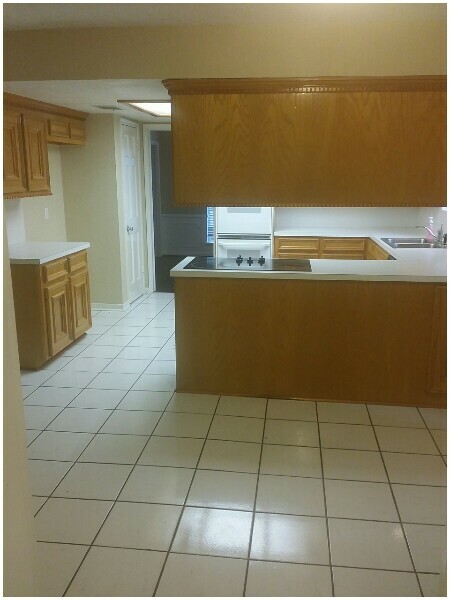 Formica countertops? Electric range? 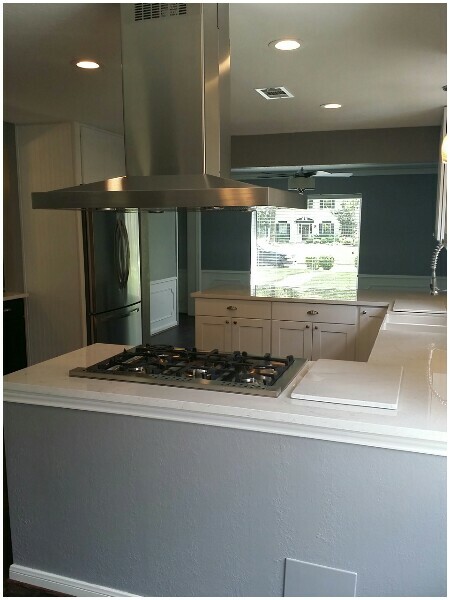 Those will be replaced with quartz and a gas range, respectively. And that wall between the kitchen and the dining room? That's coming down too, but we're going to save the wainscoting. Instead, we'll have a bar-top there. Also getting remodel will be this small half-bath on the first floor. We're going to push one of the walls back, and add a shower to make it a third full-bath.